Modern noise monitoring systems offer a wide range of advanced features and come with software that can analyse and structure long term measurements data efficiently. A complete noise monitoring system consists of one or more noise monitoring terminals, a noise server and work stations for presentation, post-processing and reporting. The noise monitoring terminal is the piece of equipment that acquires sound level and other data and transmits it to the server. It comprises the sound level measurement apparatus (microphone, power supply, sound level meter) along with an enclosure, a communication device and possibly a weather station and camera. The bases for a noise monitoring station are the microphone and the sound level measurement device. In order to be certain that your measurements are of the highest quality, the sound level meter should be approved to satisfy the standard IEC 61672:2003 “Electroacoustics – sound level meters” by a national institution such as PTB (the German national metrology institute). An approved meter is tested to give correct results under varying physical conditions. The standard defines the precision of two categories of meters: Class 1 and Class 2. A Class 1 meter is required for noise measurements in most countries. Microphones for permanent outdoor installations must be designed to withstand variations in temperature and humidity, and also resist heavy rain and corrosive climate. They should have a self-check functionality using an electrostatic actuator or a charge injection method. This way the microphones can be automatically verified so that the interval for manual inspection of the terminals can be prolonged. Still, the microphones are subject to a yearly calibration in an accredited laboratory to ensure lasting accuracy. Regular laboratory calibration is also required if measurements taken shall be valid for court cases. Additionally, a weather station might be required to do a proper analysis of the measurements; especially important is wind direction and wind speed. With advanced software for noise analysis, all measurements done during high wind speed causing a high noise level measured by the microphone can be easily extracted from the measurement results. 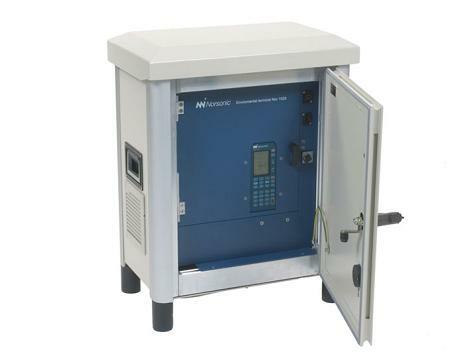 The noise monitoring terminal should be robustly designed with battery backup, tamper-proof enclosure and proper temperature regulation to secure stable long term logging of noise data. It should also have a self-monitoring function so that the status of the terminal (such as external power and battery status, door openings etc) is logged and can be verified by the operator. The communication revolution with broadband data traffic even wirelessly has opened for a new world of noise monitoring. Some years ago the most advanced systems would only allow transmission of small amounts of data. Now, transmission capacity has increased and communication prices have decreased. This means that higher resolution results can be transmitted and even sound recordings and video images may be streamed close to real time. State of the art noise monitoring terminals support all modern communication platforms such as ADSL, WIFI and 3G mobile networks. An acoustic consultant can, therefore, have access to noise measurements from a number of monitoring stations in her office and measurements can be made available real-time on the Internet. Event detection – what happened? For those responsible for noise polluting activities, it is often of high interest to get an immediate warning when sound levels are too high. For example, will the sound technician on an outdoor concert be able to reduce the volume directly if he gets a warning from a noise monitoring terminal that noise level at neighbours’ premises exceeds the local limitations. Such a warning can be sent as an email or SMS with information about location, duration and of course the measured sound level. In order to securely identify what actually caused the noise, advanced systems have triggers that can start recording of audio, video or both. These can then be streamed remotely near to real-time for immediate identification of the source, or they can be replayed later during post-processing of the data. Video recording can be very efficient to later prove what caused the noise, be it a person, a vehicle or other. Real-time access to noise levels through the Internet? In a noise measurement system with multiple terminals, the noise data are streamed to a database located in a central server. The data are being analysed and from the database, your results can be presented in any format you like. Do you wish to give a large number of people access to the measurement results, time profile graphs can be made accessible for anyone through an Internet webpage. Or do you wish to have a custom made report summarizing all events in the last 24 hours? Modern software packages can provide such reports in known formats such as Microsoft Excel or PDF. For the specialist, advanced post-processing software makes further analyses possible: Automatic selection of specific noise patterns and recalculation of average levels of different time lengths can be done. Date logged during certain weather conditions can be discarded. If sound files are recorded an FFT analysis for pure tone detection can be performed, this is a typical application for noise monitoring from wind power farms. An advantage of a central database is that data can be easily accessed by different groups that need access to data, such groups may include local authorities, acoustic consultants, the company or organization that controls the noise source and even the wide public. There are a number of national and international standards that recommend how noise from different sources shall be characterized through measurements. Traffic noise, railway noise, airport noise and wind power plants all have their own standards (see examples in table 1). The standards usually describe in detail how the measurements shall be carried out and under what meteorological conditions. Table 2 summarises the most used environmental noise parameters. LAIMax Maximum A-weighted noise level measured with Fast, Slow or Impulse time weighting. They are the highest level of environmental noise occurring during the measurement time. LAIMin Minimum A-weighted noise level measured with Fast, Slow or Impulse time weighting. They are the lowest level of environmental noise occurring during the measurement time. Lden A-weighted noise level for day-evening-night composed of the long-term A-weighted average sound level for day/evening/night respectively plus 0/5/10 dB. Modern noise monitoring systems are capable of logging or calculating all of these parameters in parallel with a time resolution down to a second. However, it is always recommended to reduce the number of parameters to a minimum and to work with a time resolution as low as possible. This way one reduces the data traffic and the amount of data to work with.